JungleDocs for Office 365 is a document automation app for Office 365. It helps you generate and populate Word, Excel and PowerPoint documents, and lets you create extensive Word reports using SharePoint list data. In this article, you will learn the basic principles of JungleDocs for Office 365. Before you jump into the tasks ahead, here are a few helpful things to know. JungleDocs for Office 365 is a provider-hosted app for Office 365 and is hosted on Microsoft Azure Cloud. These are just a few of the many ways you could use JungleDocs 365 in your organization. Now let's take a look at the way JungleDocs for Office 365 works. There is a number of ways to open JungleDocs for Office 365. They will always lead you to the JungleDocs 365 User Interface. Here you will be able to create documents and list items by selecting a Rule of your choice. Here you can also create new Rules and manage existing ones. New & From Existing - Select this if you want to create documents or list items. Reports - Select this if you want to export multiple SharePoint list items into a Word or Excel document. Read more about Rule types below. Here you can select a rule you configured before. You can also add new rules by click on the New rule button on the right of the screen. Here you can select what action you want to be performed after you run the rule. 1. When this option is selected, JungleDocs for Office 365 will display a report of actions after the rule has been executed (and the JungleDocs UI will remain opened). 3. When this option is selected the document will open in Word, Excel or PowerPoint Online (depending on the file type you creating). 1. By clicking the gear wheel you can manage your General Settings; Users; Permission Roles and Global rules. 2. The question mark gives you quick access to our support as well as help documents. 3. By clicking on the account logo you can monitor and set your usage, billing, subscription and account dashboard. 4. Click this to exit JungleDocs for Office 365 and return to SharePoint Online. The main element of JungleDocs is the JungleDocs Rule. By executing a JungleDocs Rule you can create, copy and upload documents and items. Rules also allow you to preset metadata, export SharePoint items to Word and generate custom reports. Rules have several configuration options. These options include automated document naming to fit your organisation's document management system; automated content population; ID generation and many more. There are two types of rules: New & From Existing rules and Reports rules. Rules are linked to the list/library they were created for. You can also create 'central' versions of the above rules. We call these Global rules. New & From Existing rules let you create documents or list items. They also let you use the metadata of a selected list item to create a new document or list item. By configuring the rule settings, you can select which columns you would like to copy. The ability to copy field values between items and transforming them along the way is a feature we call Smart Copy. 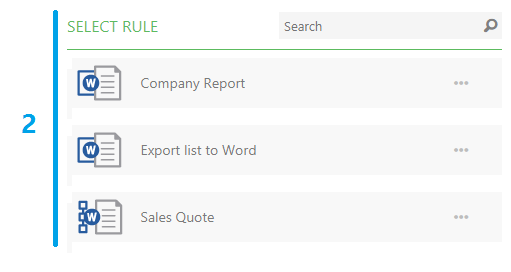 Report rules let you export multiple list items into a document. This rule is especially useful for report creation. Using this rule you can export selected items, a view or a whole list - you could even cross-reference the data you are exporting with other lists to create all-encompassing reports. Global rules are central versions of Report rules and New & From existing rules. This means that if, for example, you create a Global Reports rule, this rule can be made available on any of the SharePoint sub-sites, libraries, and lists within your organization . Note: you can set precisely in which locations or child sites these Global rules will show up. Document templates form the foundation for the documents you create using JungleDocs 365. They consist of both static and dynamic content. This means that the templates contain some content that is always there (such as your logo and address details), and some reserved spaces (content controls) that can later be filled with content from SharePoint. JungleDocs 365 populates these reserved spaces with content from your SharePoint environment and other documents through the use of content controls/placeholders. These are added to the reserved spaces in the template file. For any content that has to be used in different documents - such as proposals, quotes, presentations, reports etc. - Small Parts is a time-saving solution . All you have to do is split up the content that you use often for document creation into smaller parts/ Word or PowerPoint files (i.e. Small Parts). Once you have split your data into these smaller documents, you can use JungleDocs to select which of these parts you want to use to create a new and unique document, simply by checking boxes.